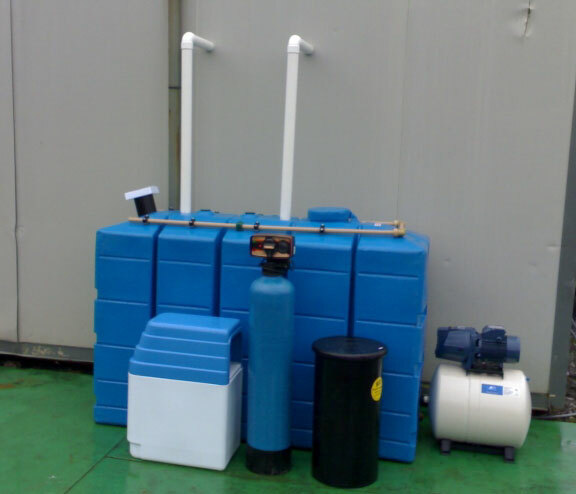 Aeration System to remove hydrogen sulphide from water. Aerators work by increasing the amount of surface area of air coming in contact with water. This may be achieved by passing air through water, as in an air diffusion aerator. In contrast, many aerators pass water through air, as in spray nozzle, cone tray, cascade, and coke tray aerators. Finally, forced draft aerators both pass air through water and water through air. Aeration is the intimate exposure of water and air. It is a way of thoroughly mixing the air and water so that various reactions can occur between the components of the air and the components of the water. Aeration removes or modifies the constituents of water using two methods - scrubbing action and oxidation. Scrubbing action is caused by turbulence, which results when the water and air mix together. The scrubbing action physically removes gases from solution in the water, allowing them to escape into the surrounding air. Scrubbing action will remove tastes and odours from water if relatively volatile gases and organic compounds cause the problem. The efficiency of the aeration process depends almost entirely on the amount of surface contact between the air and water. This contact is controlled primarily by the size of the water droplet or air bubble. The goal of an aerator is to increase the surface area of water coming in contact with air so that more air can react with the water. As air or water is broken up into smaller drops/bubbles or into thin sheets, the same volume of either substance has a larger surface area. Dissolved in water, it forms a very weak dibasic acid that is sometimes called hydrosulfuric acid, in high concentrations it will lead to almost instantaneous poisoning. High concentrations will result in the complete arrest of respiration. Exposure to lesser concentrations may result in nausea, stomach distress, belching and coughing. Moderate concentrations may result in eye irritation.